Over the last few weeks, we’ve been hosting a few very welcome guests. A number of Burnaby South Secondary (new window) students have been coming to our office a few times a week to build LipSyncs. 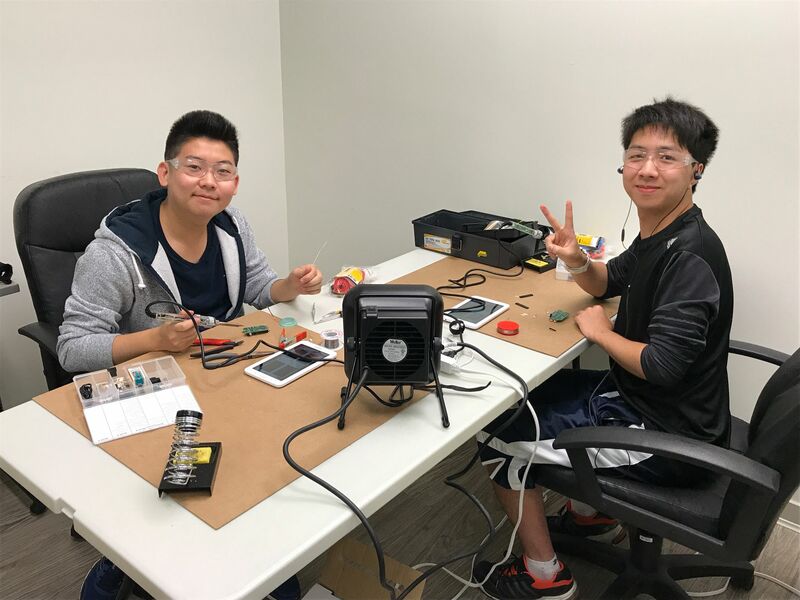 Marcus (left) and Sam (right) have been among the Burnaby South Secondary students coming to the Neil Squire Society’s Burnaby office to build LipSyncs. As you may remember, Burnaby South Secondary is where the first two of our high school Buildathons took place. Sam, who just finished Grade 11, was one of the makers who was at both. The makers at the events got to see first firsthand people receiving the LipSyncs they had just built. For Sam, that experience was quite profound, seeing someone benefit from his work, and be able to use a smartphone — something that most people take for granted. Looking to volunteer, Sam decided to do something he both found fun — building a LipSync wasn’t the first time he soldered — and something he knew made a difference. He could put his skills to good use. “Not only am I doing things that I’m familiar with, but also [it’s about] what it is for,” Sam says. That’s truly what the LipSync project — and on a larger level, Makers Making Change (new window) — is all about. We want to facilitate a kind of skilled philanthropy, helping people use their skills to create access for people with disabilities.